I always say that we all have a story to tell. Our lives, while normal to us, can be very interesting to others. Over the years I am always amazed at the incredible lives my patients have lead. You never know who someone might be until you ask. With their permission, some of our patients have agreed to let me tell you about them. Look closely because the next time you visit our office, you may be sitting next to a celebrity and not even know it! 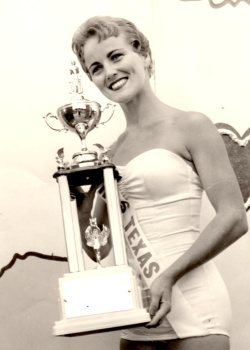 Gloria Gruber is now a grandmother of 11, but in her prime, you would have had to call her “Miss Texas”. 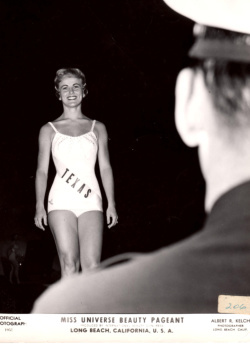 She represented Texas in the Miss Universe pageant in 1957, placing in the top 10. Gloria, or GG as she likes to be called, grew up in Corpus Christi. “As a child my mom entered me into pageants, but I was always a tomboy at heart. I would have rather been out playing ball with the boys.” In high school, she and two friends formed a singing trio and called themselves the Lee Sisters. They gained enough attention to be invited to go to New York to sing on the Arthur Godfrey Radio Program which led to a recording contract with Palace Records out of California. Their single, “On A Wing and A Prayer” made it into the Top 20 on the Texas Radio charts. They were invited to be a warm up act for none other than the King, Elvis Pressley. “I remember that they had stretchers available for all the girls who would pass out when they saw him. 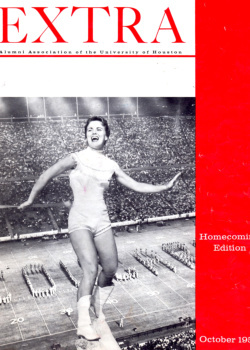 It was quite an experience.” But pageants were never too far away and in 1957 she was selected as Miss Corpus Christi which led to her victory at the Miss Texas pageant. “In those days, there were two different pageants. One went toward Miss USA and Miss Universe which I did, and the other toward Miss America.” After competing and placing well, scandal broke out when the Miss USA winner was found out to have been married, which was against the rules. The runner-up was eventually given the crown. 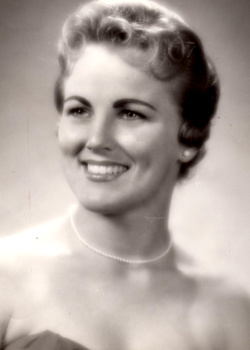 After the pageant days were over, Gloria had three children who now all live in Austin near her. Her oldest son, Kelly, was drafted out of high school and eventually went on to play third base for the Toronto Blue Jays when they won the World Series. Her real joy now is her grandchildren. Her favorite moments are watching them compete, but no matter how well they do, they’ll have a hard time outshining their grand mom!